Just like the Ford Freestyle in India, the Ka Urban Warrior is a raised up car with SUV-like tough design elements added all around. Elements like the faux skid plates, blacked-out bits like the headlamps, grille, wheels and chunky lower body cladding also add to the tough look. 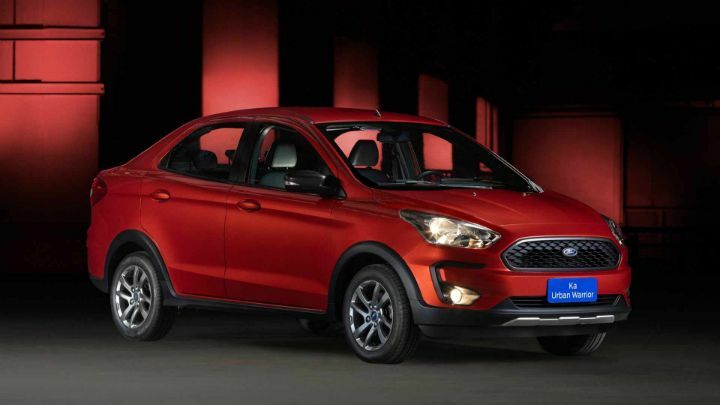 Ford has showcased a tougher looking version of the Ka Sedan (known as the Figo Aspire in India) at the ongoing Sao Paulo Motor Show 2018. It’s got a tough name too - the Ka Urban Warrior. While hopped-up, tougher looking hatchbacks masquerading as SUVs are quite common worldwide, crossover-like sedans are quite rare. In fact, the only other rugged sedan apart from the Ford Ka Urban Warrior we can think of is the Volvo S60 Cross Country. Inside, the Ford Ka Urban Warrior gets a full-black theme, unlike the black-and-brown found on the Figo Freestyle sold in India. It looks like the Ka gets faux-leather seat covers though, with subtle orange contrast stitching for some visual relief. The centre-piece is the new 6.5-inch touchscreen with Android Auto, Apple CarPlay compatibility and Ford’s SYNC 3 tech. The Ford Ka Urban Warrior is powered by a 1.5-litre, 3-cylinder petrol engine developing 138PS of maximum power (15PS more than the same engine used in the Ford EcoSport) paired to a 5-speed manual gearbox. Is there a market for crossover-like sedans in India? Let us know your thoughts in the comments section below. Share your experiences with Aspire 2018?